Hummus and I go way back. Back to the early ’90s, in fact. It’s a long story, but my daughter Allison – yes, the same Allison who is my FoodLove blogging partner – could not swallow solid food for the first couple of years of her life. Everything she ate had to be pureed, mashed, or chopped into tiny pieces. I was in graduate school in Chicago at the time, and Allison had a nanny – a lovely, tall, rail-thin young woman from Israel named Iris. Iris was sympathetic about Allie’s eating problems, and one day she told me, “I’m going to teach you how to make the most wonderful food, that my mom makes at home in Israel.” That’s when I learned how to make hummus. Iris didn’t seem too impressed by my hummus-making efforts, and I’m sure my early attempts at hummus didn’t compare with her mother’s. But I thought it was a miracle. Here was a food that was nutritious, easy to make, inexpensive and delicious, that my daughter could eat. Bonus – my husband and I loved it, too! So I like to brag that I knew hummus before hummus was cool – in the United States, at least. Now you can buy hummus at every grocery store or 7-11, or by the half gallon at Costco, but it’s a lot cheaper to make it for yourself. I like to try different varieties of hummus, but my favorite is the traditional Middle Eastern style, flavored with lemon, garlic, cumin, parsley and olive oil. The main ingredient in hummus is chickpeas, also known as garbanzo beans. Dried beans are some of the cheapest foods you can buy – I got a pound of garbanzo beans at my local supermarket for 99 cents, and when cooked they were equivalent to about five cans of already cooked beans. I’m a bit of an environmentalist, so the fact that the beans were packaged in one small bag rather than five cans made me happy as well. One of my favorite ways to cook beans is soaking or quick soaking the beans, and then cooking them in the pressure cooker. If you don’t have a pressure cooker, the best thing for this recipe is to soak the beans and then cook them on the stovetop. For hummus, it’s best to cook the beans a little longer than normal, so they are very soft. The soft cooked garbanzo beans are combined with roasted garlic, lemon juice, olive oil, tahini, cumin, salt and water in a food processor or blender and pureed until very smooth. Tahini is a nut butter, like peanut butter, made from sesame seeds. It can be found in most grocery stores near the other nut butters. I don’t recommend skipping or substituting this ingredient. Store your leftover tahini in the refrigerator, and it will keep for a long time. Be patient as you process the hummus. 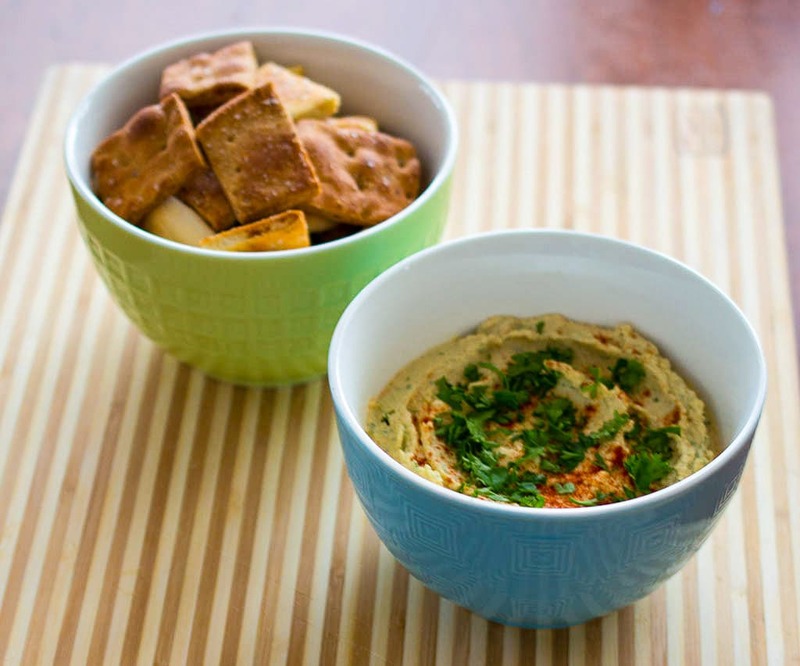 A little extra processing time can help you achieve a smoother, lighter hummus. Once the hummus has almost reached the consistency you want, add some fresh chopped parsley to finish. 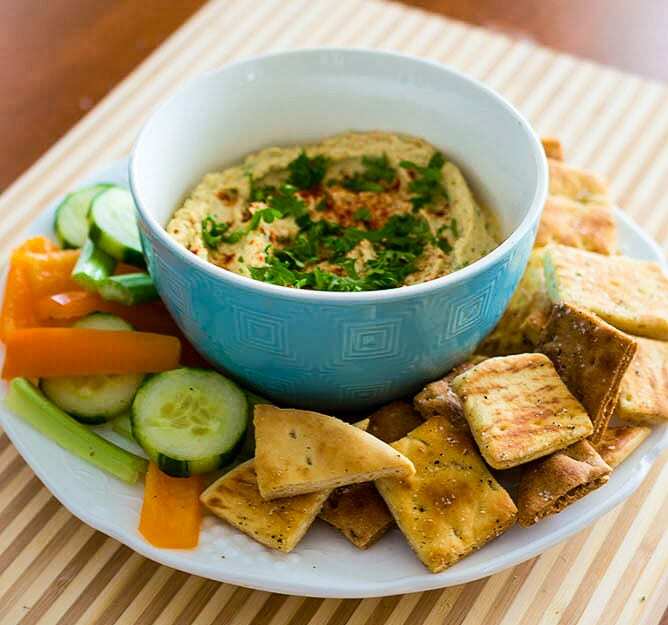 I like to serve this hummus sprinkled with smoked paprika and chopped parsley, with fresh vegetables and homemade garlic-and-black-pepper pita chips on the side. Crunchy, addictive pita chips are super-easy to make yourself using whole wheat pitas, and you can flavor them any way you like, but I love this garlic and black pepper combination. This easy, Israeli-inspired hummus recipe uses traditional ingredients for a Middle Eastern flavor. Rinse 3/4 cup dried chickpeas (see notes) with cold water in a colander, then place in a pot or bowl with enough water to cover by 3 inches. Soak overnight or for 12 hours. If you are using the quick soak method, bring the chickpeas and water to a boil, boil rapidly for one minute, turn off the heat and allow to soak for one hour. Drain the chickpeas and discard the soaking water. Place the chickpeas in the pressure cooker and cover with water about one inch above the level of the chickpeas. Add 1 teaspoon salt to the water, if desired. Cook for 25 minutes at high pressure. Allow pressure to release naturally for about 20 minutes, then use quick pressure release if any pressure is still remaining. Check the chickpeas for doneness; they should be very soft. Sometimes, if dried beans are old, they require additional cooking time. Drain the chickpeas, reserving about one cup cooking liquid. Follow the rinsing, soaking and draining steps outlined for the pressure cooking method above. To cook the beans, cover with water equivalent to double the volume of the chickpeas. Add one teaspoon salt to the water, if desired. Bring the chickpeas to a boil, then reduce the heat, cover, and simmer on the stovetop on medium to medium low heat for about one hour. Test the chickpeas for doneness; they should be very soft. Drain the chickpeas and reserve about one cup cooking liquid. Preheat the oven to 350 degrees. Cut the top off one bulb garlic to expose the tops of the cloves. Drizzle with olive oil and sprinkle with salt and pepper. Place in a garlic roaster or other ceramic or glass dish with a lid. Bake for about 45 minutes, or until garlic cloves are golden brown and very soft. You will use only 2 garlic cloves for this dish, so remove the other garlic cloves from the bulb and preserve them in olive oil in the refrigerator, or without olive oil in the freezer for future recipes. Place the beans, tahini, olive oil, lemon juice, garlic, cumin, salt, and 1/4 cup water in a blender or food processor. Use the cooking water from the beans if available, but otherwise use plain water. Process until smooth, adding more water if needed, and scraping down the sides of the blender or food processor as necessary. It may take some patience to achieve a smooth, light consistency. Once the hummus has reached the consistency you want, add the parsley and process until finely chopped. 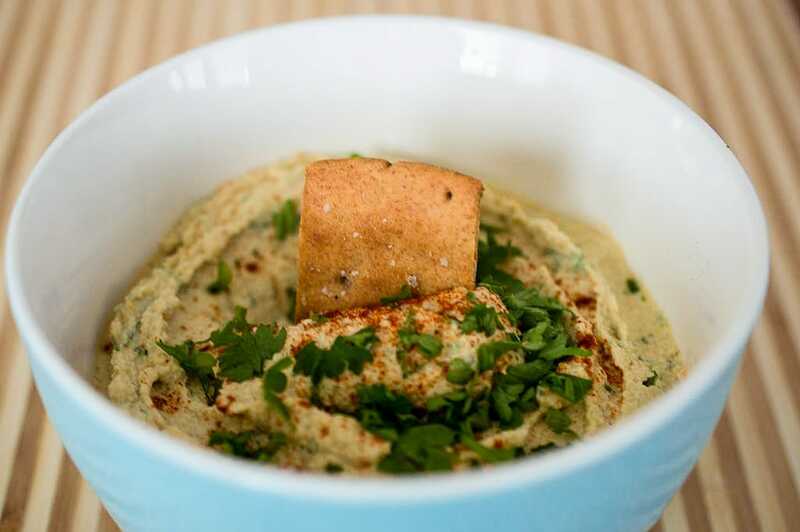 Serve the hummus garnished with smoked paprika and additional chopped parsley. Preheat the oven to 350 degrees. Brush or spray each pita with olive oil, then sprinkle lightly with garlic salt and black pepper. Do this for both sides of the pita. You do not need to use all the olive oil, salt or pepper; the amounts given are approximate. Cut each pita into 4 strips with a pizza cutter. Cut each strip into 3-4 chips. Place the chips on an ungreased baking sheet, and bake for about 15 minutes until browned and crisp. The chips will not be completely crisp when you take them out of the oven. They will become crisper as they cool. Tahini is a paste made from ground sesame seeds, similar to peanut butter and other nut butters. It can be found in most grocery stores near the nut butters. [br][br]If you are taking the time to cook dried beans, you can cook larger quantities and store them in the freezer for future recipes. [br][br]If you don’t have time to roast garlic, you can use raw garlic, but it will have a stronger, sharper flavor. Or you can substitute one teaspoon granulated garlic.